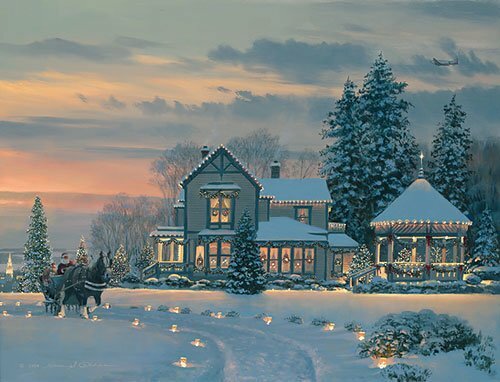 With newly fallen snow covering the landscape around the Winchester Inn, Mike, the innkeeper, sets out on his annual Christmas Eve rounds. After hitching his team to the inn’s ancient sleigh, he bundles two large sacks of gifts destined for the neighborhood children. Gift giving is a Christmas tradition enjoyed over the holidays by the inn’s many visitors. The Winchester Inn, nestled among the Cotswold Hills in Phillips Bay, dates back to the early 1880s. The Winchester is known far and wide for its warm and friendly atmosphere, wonderful rooms and sumptuous meals, making it the perfect place to spend Christmas Eve.